Opposite the Turner Contemporary Museum and within a Victorian grotto on Folkestone seafront stands a temporary installation by Dutch artist Krijn de Koning titled Dwelling. 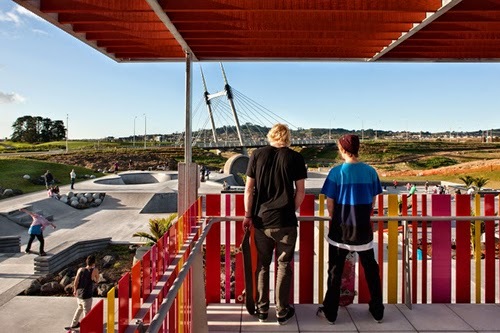 The colourful architectural labyrinth walkway comprises of a series of angled walls punctured with doorways and windows that create a trail for visitors to navigate through, while using the existing surroundings to create a new experience of the space (see more images here). 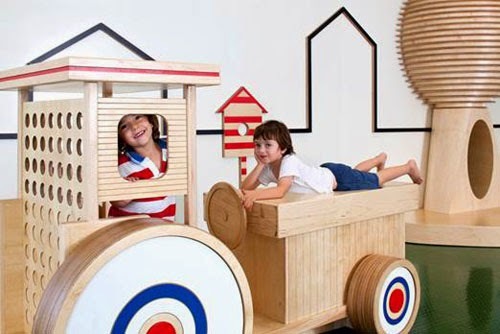 The installation provides an air of fun and exploration - notions inspired in many early childhood settings to promote self learning through play. And upon further investigation, Krijn has in fact worked with architects Teeuwisse & Willems to create a space for an educational centre in Soest, Germany. Here, a wall and ceiling structure stretches over the common hall space and on the other side creates two smaller play areas. Like a creeper, the green form "climbs" across the existing surfaces creating new areas to explore and experience physically. The installations providing a new lease on what would otherwise be a "boring" or rather standard (walls, ceilings and floors) space. It may not be for early childhood, but due to my frequent musings every time I drive past it I thought I'd share. 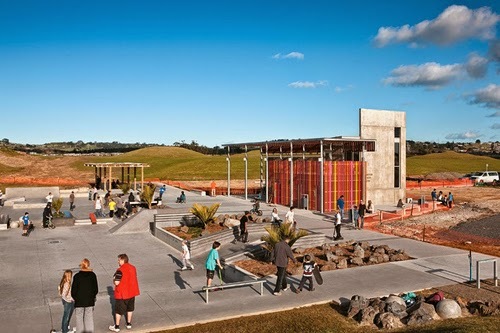 In the words of Linda Tyler from Architecture Now, the "technicolour dreamcoated" structure designed by ArchOffice is a "beacon in the wilderness of the 94-hectare Barry Curtis Park"
Termed the Ormiston Activity Centre, the building sits in the new Auckland development site of Flatbush, which is estimated to house 40,000 people by 2020. Unfortunately, the area is already blighted with rows upon rows of "matchbox houses" like the above. Hence my astonishment at witnessing the colourful "activity centre" which sticks out like a sunny sore thumb among the dreary urban monotony. A stair tower, meeting room for up to 80 persons, toilets and a viewing platform (over the toilet block) like building blocks, make up the elements of the building. 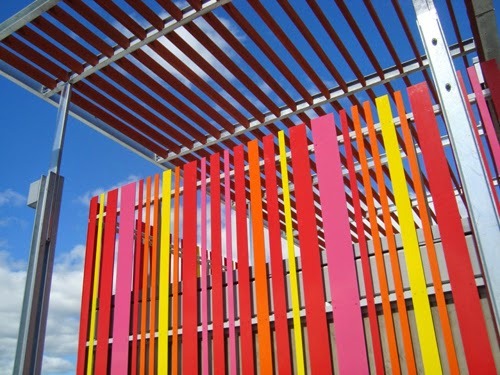 While precast concrete, concrete block and vertical steel flat bars coloured in cyan, magenta, yellow and green (CMYK) clad the exterior and form the balustrade above. While I am saddened by the site's development so far, this wee youthful structure is a beacon that says there is hope for the area yet. 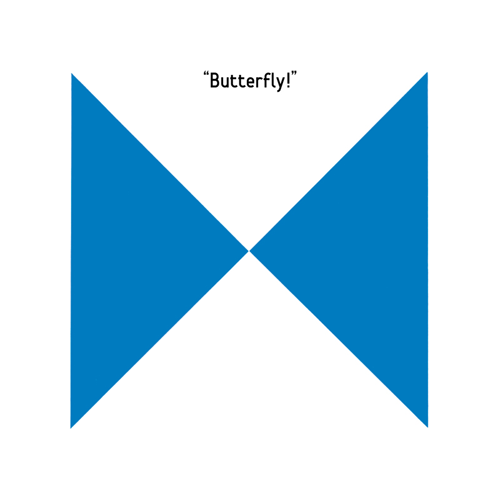 The story below by the french children's story book writer Anne Bertier reminds me of Froebel's abstracted geometries for teaching children the "essence" or basic "building blocks" of the natural world. It is a story that also speaks to adults - teaching basic fundamentals to perhaps more complex notions. 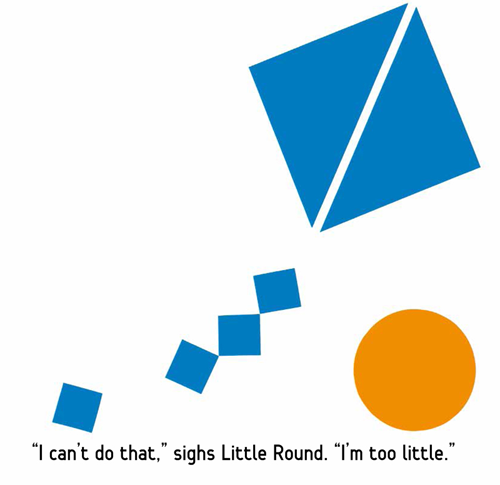 It is the story of two friends, Little Round and Big Square who get together every Wednesday to play a game. 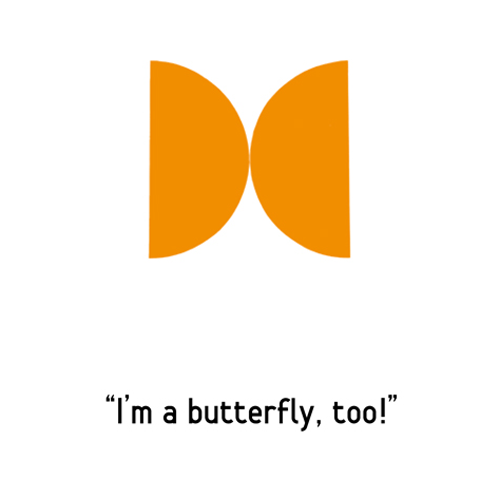 A game of association and transformation, where "as soon as one of them says a word, they transform themselves into it." 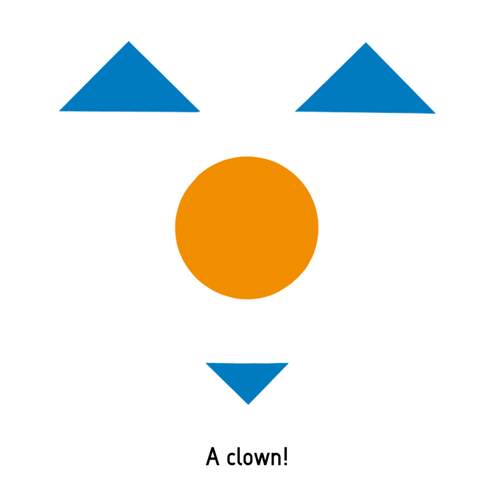 But the fun abates when Little Round begins to feel littler and insufficient, as Big Square begins to parade a repertoire of words beyond Little Round's capabilities. They form a rift and go to opposite sides of the room. Not only is the story a simple but poignant portrayal for the way we transform the building blocks of life, but also shows that whether we are big or small (age or otherwise) - each has something to offer. 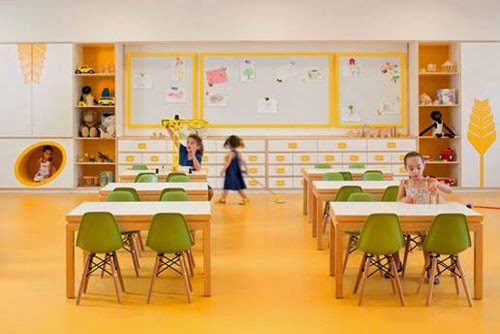 I've shared Sarit's beautifully graphic fun-filled interiors for children before, and now she has done it again with these two new centres in Tel Aviv, Israel. The first, "Hello First Grade" is actually an interesting brief, which hopes to soften or ease the transition for children going from early child care to school (the Arts & Science Elementary School). Thus the environment was designed to be inviting and encourage childrens' eagerness for learning. Central to the school's design is a large magnetic wall designed as a notebook page connecting rows of wooden pencils in a range of colours to letter, number and geometric magnets. Allowing children to arrange these to will. Left is the 'music corner' - located within a large wooden drum. Here, children can listen to their chosen music through headphones. Right, is the 'dance corner', which hosts a stage and dance bar for rehearsing and performances. A 'reading and friendship corner' situated in wooden blocks has cushioned seats, activity tables and library niches - catering for quiet or 'study' activities. A black and white checker floor promotes physical movement or play, while a large screen embedded in a robot's head offers technological play and learning (through games and films). 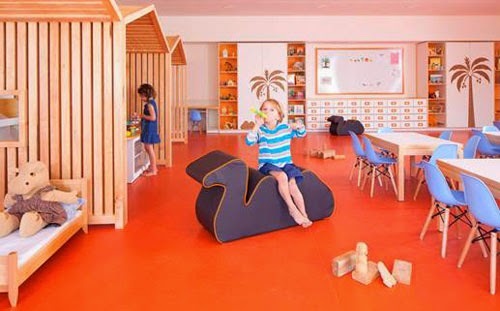 The design caters for a range of learning types and stimulation of the senses. Sarit's second project is in Kfar Shemaryahu and covers 2,400m² which includes six kindergartens, a common play area and an 'empowerment centre' providing psychological services to the community's children. The centre's design is inspired by both the city's agricultural past, as well as the "seven species" of the Bible denoting the profusion and fertility of the Land of Israel and its diverse crops. 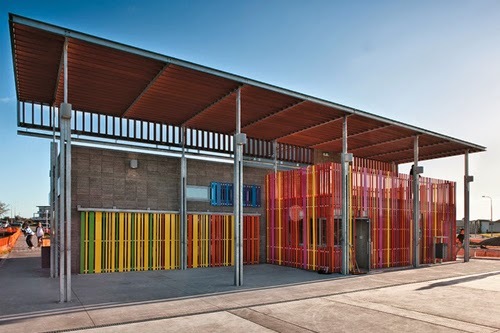 The distinctive character of each kindergarten was dictated by the species identified with it, which served as a design code and gave rise to its colour scheme and components. 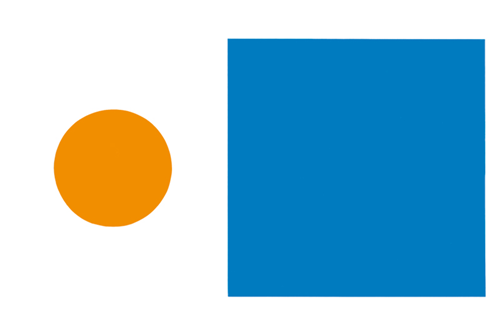 Graphic and symbolic motifs meet functional learning motives, as well as serving to inspire the "fun of learning". The central lobby acts as a axis binding all of the kindergartens together, whilst serving as a play area and passageway to the Empowerment Centre. The lobby space (above and below) plays a key role in outlining the overall narrative of the centre. The child arrives and witnesses scenes of a village, such as the large tractor and sculptural islands with raw-birch plywood trees on the floor. And on the walls, graphics imitating the contours of the landscape: a water tower, a watchtower and various animals all made of woodcuts in Formica on plywood. The six kindergartens echo one of the three 'themes' composed by Sarit and are divided either by modular furniture or by airy wooden huts. 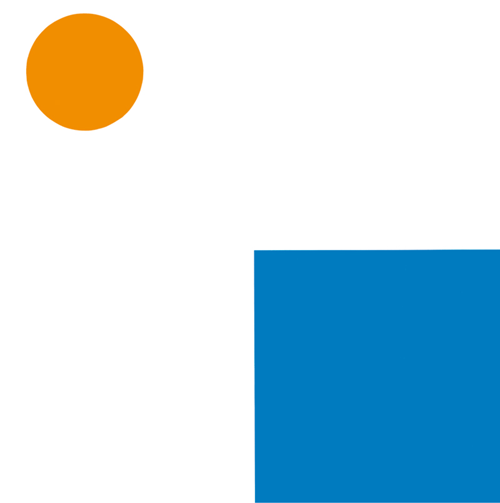 The first theme is the 'Tamar (Palm) Kindergarten' - the orange palette echoing the colour of ripe dates. 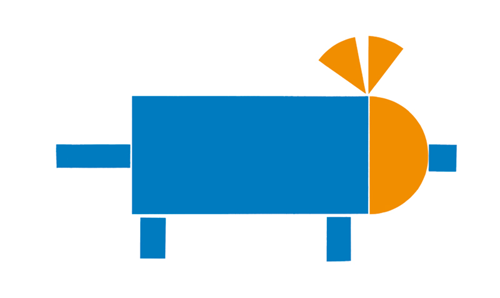 The graphics drawn from palm trees: oasis, camels and huts with maple wooden beams. The 'Zayit (Olive) and Gefen (Vine) Kindergarten (below) caters to toddlers. Cushioned seats and age-related activities serve the child's physical and learning capacities. Graphically, a dove bearing an olive branch is imprinted on the cupboard doors. A symbol of peace which alludes to the the underlying 'seven species' concept - teaching tolerance and respect. 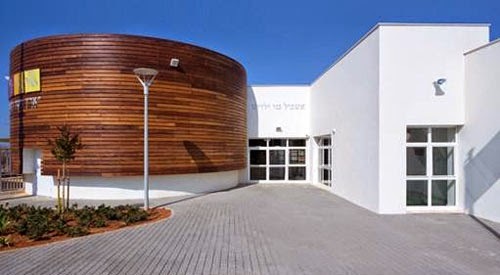 The 'Rimon (Pomegranate) Kindergarten' (below) takes it inspiration form the pomegranate tree. 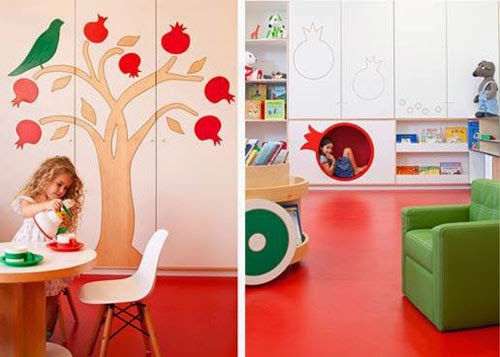 A pomegranate jigsaw puzzle (like) piece is imprinted in the cupboard doors, and the pomegranate fruit is incorporated as a round hiding place and sheltered play area in the cupboard as an upholstered stool. The Empowerment Centre serves the community providing special rooms and psychological services. 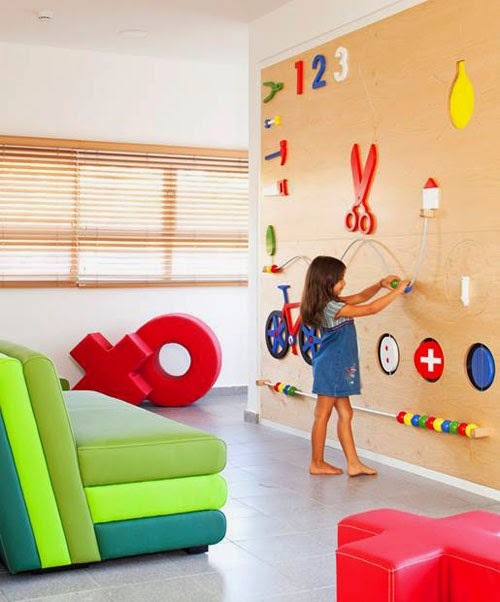 The waiting area contains an interactive wall combined with various textures, containing a wide range of games such as a clock with hands, a turning bicycle wheel, wooden balls threaded on a ball among more. 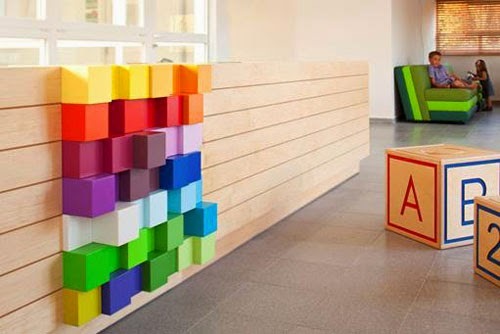 The reception desk (above) is made of maple wood with colourful 3D pay blocks incorporated into it, while large sculptural blocks scattered on the floor with numbers and letters help to make the waiting children feel relaxed and be occupied through play. Both new educational spaces for children successfully celebrate the child's capacity for learning through exploration and play. A fantastic initiative, the Espacios de Paz (Spaces for Peace) project in Venezuela is turning “zones of danger” into “zones of peace” through participatory design in violent areas of the country. 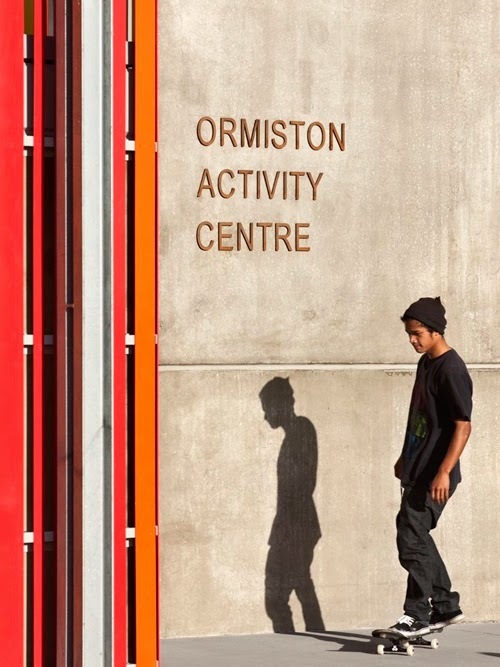 The initiative's focus was to create “a space built not only “for” the community but “by” the community,” and shows how a little thought and a new built structure can be a seed for regeneration and instill a sense of community back into a space. 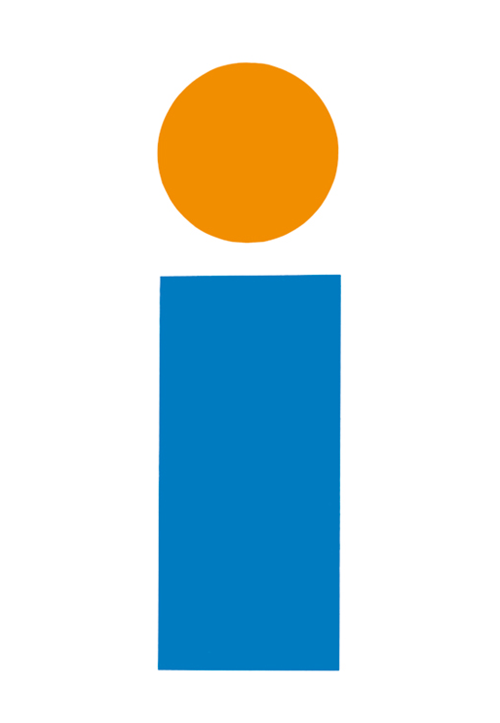 It is a relevant methodology to apply to the ethos, and design and construction of early childhood centres. 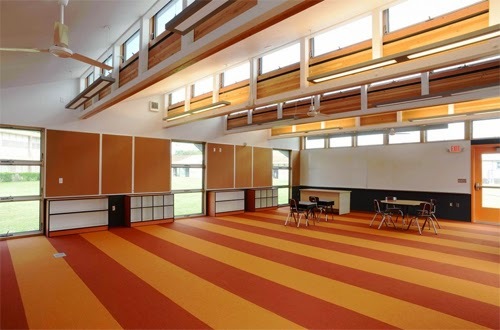 Following the lead of the modernists (see earlier post here), who envisaged an architecture of clean functional modular parts - are these classrooms designed by Anderson Anderson Architecture for Hawaii. Not only does the design allow for fast and efficient construction, but focuses on the occupants' health and comfort and teaches about eco efficiency and energy consumption. The energy performance of the building is monitored and broadcasted to students inside as well as to the web for all to view - thus the building becomes a tool for learning about energy consumption and preservation. The design also considers lifecycle (energy and maintenance) costs and will be monitored for it's performance over two years. Thus any issues are noted, reported, analysed and subsequently improved upon - ultimately (hopefully!) improving the quality of future learning spaces for all. 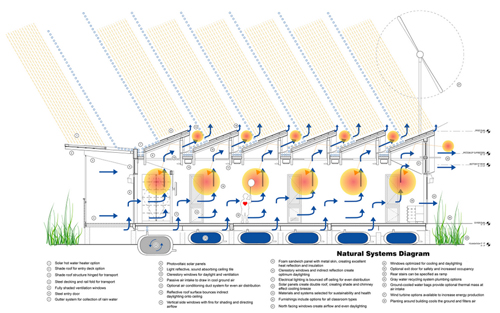 Focusing not only on energy efficiency (for example with the use of photovoltaic panels) the building's design provides comfort with shaded north-facing daylight glazing and ventilation (providing thermal comfort), while materials are chosen not only for their low-maintenance but for being healthy (low-VOC) and acoustically comfortable. 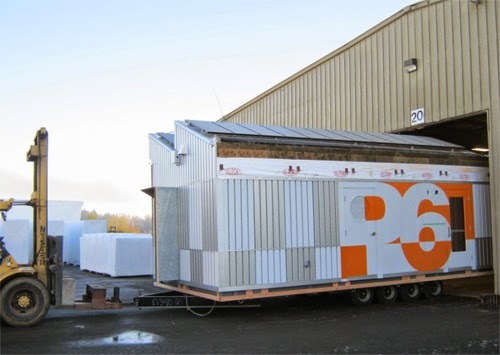 The building is prefabricated in three easily transportable modules, reducing initial cost and energy. 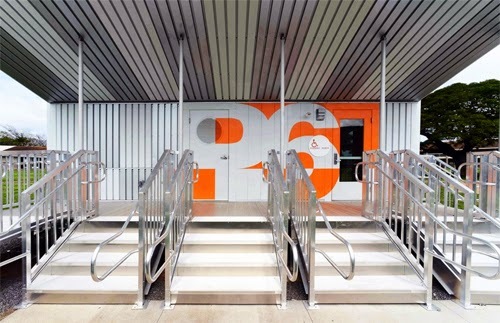 A steel frame and steel and rigid foam, sandwich panel floor and roof system with a double-skin wall metal cladding reduces heat gain. The modularity of the construction system allows relocation and future re-use of the building without typical demolition and disposal waste of materials and embedded energy. One in four students in Hawaii currently study in poor-quality portable classrooms. The States plans to replace 10,000 of these units over the next ten years. This classroom concept being mass produced hopes to meet the demand for classrooms as required.